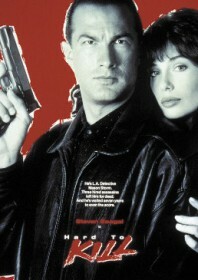 Another Seagal cop-bent-on-revenge film that delivers quality in a completely different sense of the word: stocky dialogue, cardboard characters and action scenes that go way overboard. This is a B movie without remorse and brilliantly crappy entertainment. As cool policeman Mason Storm, Seagal is the ultimate indestructible superhero whose undercover antics into corrupt coppers puts his family in immediate danger. With his loved ones slaughtered, Mason enters a seven year coma, only to eventually recuperate, fall for his nurse (LeBrock), build up his martial arts strength and exact revenge in the only bloodletting way he knows how. The car chases and shoot outs are plodding but the brief spurts of fisticuffs are handled very well and are the best parts of the movie. The most shocking aspect is actually Seagal’s wife LeBrock, who scarily proves there is someone with even less acting ability than her pony-tailed hubby.